The Village Beacon Record, left, and The Village Times Herald published this piece in print on Oct. 27, 2016. 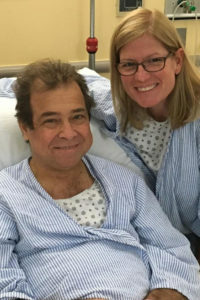 Brookhaven Councilwoman Jane Bonner (C-Rocky Point) did not hesitate when her friend Tom D’Antonio said he needed a kidney. She decided right then, at the Huntington Lighthouse Music Festival in Huntington Harbor in September 2015, that she would share her spare. She underwent comprehensive medical testing at the end of the next month to determine if she would be a viable donor — a blood test, chest X-ray, electrocardiogram, CT scan, MRI, psychological evaluation and cancer screening, to name a few. The surgery was April 26, a Tuesday, at New York Presbyterian Hospital. Bonnor was home that Friday and missed only eight days of work. She said she just had her six-month checkup and she is in good health. Brookhaven Town Councilwoman Jane Bonner and her friend Tom D’Antonio after their surgeries to transplant her kidney into his body in April. Photo from Jane Bonner. Bonner said she takes every opportunity to share her story to bring awareness about the importance of being an organ donor. “I want to be a living example to show that it can be done because it’s life changing for the recipient and only a little inconvenient for the donor,” she said. There is a large need for organs in New York. More than 9,700 people are on the organ waiting list, and someone dies every 18 hours waiting for one, according to LiveOnNY, a federally designated organ procurement organization. New York ranks last among the 50 states in percent of residents registered as organ donors, despite surveys showing 92 percent of New Yorkers support organ donation. Only 27 percent of New Yorkers are enrolled in the state registry, versus the average of 50 percent registered across the rest of the country. Stony Brook Medicine and Stony Brook University hosted the Organ Donor Enrollment Day event Oct. 6, including Bonner, in a statewide effort to boost the number of registered organ donors. Dawn Francisquini, transplant senior specialist for the hospital, said volunteers enrolled 571 people. There are two ways to become an organ donor. One is to be a living donor, like Bonner. A potential donor does not have to know someone in need of an organ to donate a kidney, lobe of liver, lung or part of a lung, part of the pancreas or part of an intestine. The most common way is by registering when filling out a driver’s license registration or renewal form to be considered as a candidate upon death. According to the U.S. Department of Health & Human Services, though, only about three in 1,000 deceased people are suitable for organ donations. Doctors determine whether organs like kidneys, livers, bones, skin and intestines are medically viable for a waiting recipient and they typically go to patients in the same state as the donor. 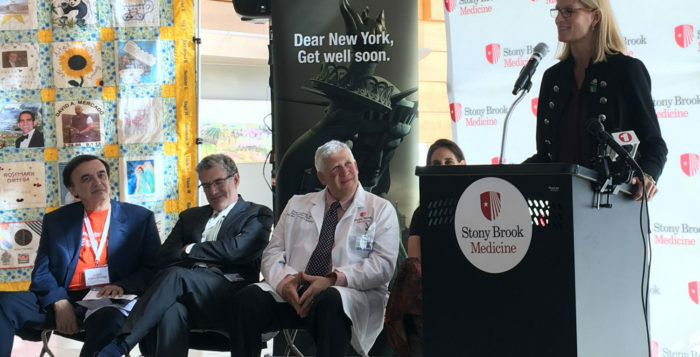 Brookhaven Town Councilwoman Jane Bonner speaks at the Organ Donor Enrollment Day kickoff event at Stony Brook University Hospital Oct. 6. Photo from Bonner’s office. Gov. Andrew Cuomo (D) signed legislation Aug. 18 allowing 16 and 17-year-olds to register as organ donors. If they die before turning 18, parents or guardians are able to reverse the decision. “By authorizing 16 and 17-year-olds to make the selfless decision to become an organ donor, we take another significant step to grow the state’s Donate Life registry and create opportunities to save lives,” Cuomo said in a statement. Francisquini said she thinks this new law will make a big difference. Previously, because those under-18 were not allowed to express their wishes when filling out a driver’s license form, many would not register as donors until years later when renewing their license. Since her surgery, Bonner has shared her story in speeches, panel discussions and on social media using the hashtag #ShareTheSpare.